It occured to me that in the midst of the holiday party season, people would be clamoring for new, unusual and easy to make appetizer variations. This nosh is basically a potato skin with an eastern european flavor thrown into the mix that will undoubtedly delight the taste buds of your holiday guests. Kharcho has become one of my favorite spice blends and I’m sure it shall become one of yours as well. I stuffed small new potatoes with this filling, but you could just as easily use zucchini or a pastry cup as a vessel. If you want to use the potatoes, select smaller, bite-sized potatoes and after washing, poke once with a knife. Steam for ~20 minutes until softened and set aside to cool. Once cooled, cut in half and use a small spoon or paring knife to cut a well in each half. Lightly mist with olive oil and pan-sear until the cut side is golden. Stuff with ~one teaspoon of filling and place on a platter. Drizzle a small amount of olive oil in a pan over medium heat. Sauté the onion, garlic, eggplant, pear and apricot halves until softened. Add the peas, pistachios, Kharcho, red pepper flakes and parsley. Season with salt and pepper. Desserts can be decadent and good for you! 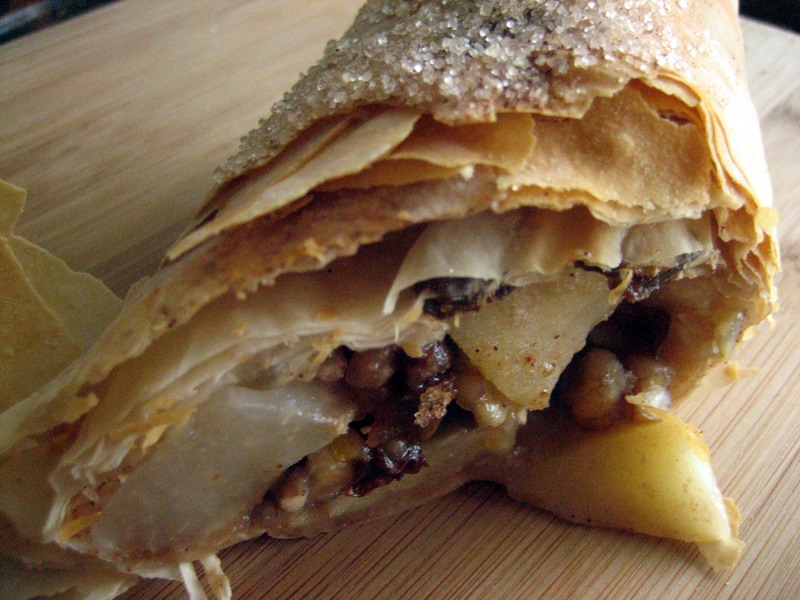 While sweet and satisfying, this simple strudel contains nutritious fruit and vegetables with fiber to help mellow out those sugar rushes. Add the pear, sweet potato, ½ the sugar, walnuts, flour and salt to a bowl and mix well. Spread the filling out in a line, length-wise about 3 inches from the bottom edge of the sheet. Sprinkle with the dark chocolate. Roll the phyllo over the top of the filling and tuck in the sides as you would while wrapping a present. Continue to roll until all the pastry has been used. Set the strudel seam side down and gently rub the entirety with walnut oil. Dust the remaining sugar over the top. Bake for 40 minutes, or until the phyllo is golden brown on the edges. 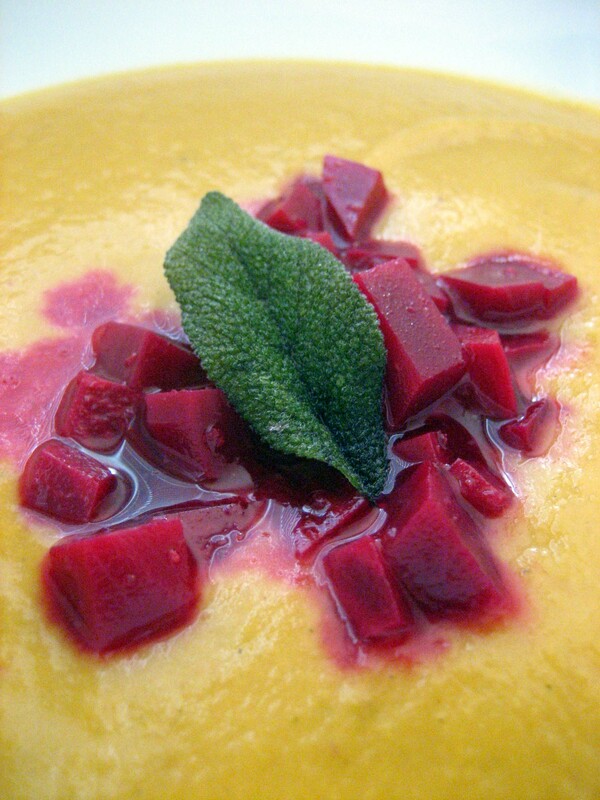 This is such a nice autumnal soup and the spiced beets add a wonderfully unexpected twist! Roast the squash 400°F for 45 minutes. Pan roast the pear and apple, sauté the onions in the olive oil used to fry the sage leaves. Add everything to blender. Adjust seasonings. Garnish with the fried sage leaves. Add everything to a pot. [Place cloves and cardamom pods in a tea strainer for easy removal.] Simmer until the beets are tender. Drain and spoon on top of the soup. A couple of weeks ago, Jasmin Singer of Our Hen House, and her partner Mariann Sullivan, shared on Facebook that they were going to begin a 10-day juice cleanse because they felt the need to “reboot” their systems. Jasmin welcomed any and all to join them in the venture. Over the course of the following few days, the idea intrigued me more and more because I’d never experienced such a thing. Having always been somewhat curious about fasting/cleansing, I decided that I’d jump in with both feet and commit to the experience. It wasn’t as difficult as I’d imagined it would be. Yes, I missed hot food and the textural quality of meals, but when I reminded myself that I was treating my body to a rich source of exceptionally digestible phytonutrients, thereby giving my digestive system a breather, things just didn’t seem quite so austere. It also helped my will-power tremendously to know that I wasn’t alone in the undertaking. The interesting results were that aside from losing five pounds, there were no physical manifestations that I could detect. That doesn’t necessarily mean that there weren’t any, I just didn’t experience any of the usual detoxification symptoms such as crankiness, headaches, nausea, dizziness, fatigue or skin blemishes. I suppose that it could be a testament to just how cleanly we have eaten this past year since we cut out all processed foods and animal products. I know that I certainly feel better since we embarked upon our own food revolution, and I’m quite sure that Heather does as well. In one of the last video logs of her juice cleanse, Jasmin remarked that she and Mariann would like to start incorporating more healthy raw foods into their diets. From my perspective, this was a fabulous thing to hear because it afforded me the opportunity to thank them, in my own particular way, for allowing me to tag along on the journey, and for all the support and community they provided along the way. Simply because I didn’t manifest any outward symptoms of a cleansing doesn’t mean that I didn’t learn anything from the experience! And so, Jasmin and Mariann…I raise my fork to you both in gratitude by dedicating the creation of my very first raw entrée to you. I wish you and yours good health and vast happiness. I purposefully chose the Asian pear, lemon zest and Brussels sprouts to add sweetness, bitterness and a touch of refreshing acidity, respectively, in order to cut through a very rich mushroom sauce which would otherwise become quite monotonous. [I never could eat an entire plate of Fettuccine Alfredo for this very reason.] Adding a variety of textures to a dish is also very important to me when considering ingredients. The Asian pear “noodles” add a softness that is more familiar when thinking of a “noodle” dish than the interestingly crunchy texture of kelp noodles. I also chose Brussels sprouts because Jasmin mentioned that Mariann was rather fond of them. If you don’t share this love of the cruciferous, you could easily substitute with thinly sliced endive. Place the dried shiitake mushrooms into the water and allow to rehydrate for at least 30 minutes. [You shall be using this soaking water later, so do not discard] Squeeze out any residual water and reserve. Remove the stems and then slice into thin strips. Drain the cashews and toss into a blender. Add ¾ cup of the reserved shiitake soaking liquid, lemon juice, lemon zest, thyme, salt and pepper. Process until smooth. Add the mushroom powder. Continue blending until the mixture is silky smooth and creamy. Slice the Asian pear into spirals or shreds and place in a bowl containing acidulated water [A good squeeze of lemon juice will do the trick]. Rinse the kelp noodles under cold water to separate. Place both “noodles “into a colander together and drain well. 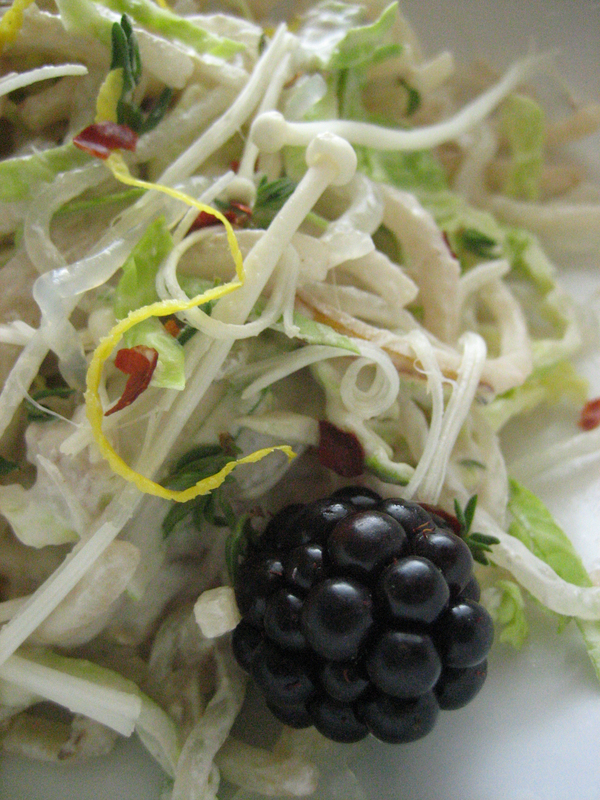 Garnish with the blackberries, lemon zest, thyme and crushed red pepper. This dish was the result of another farmer’s market excursion. It’s still early in the season but a produce stall had some lovely baby turnips with greens attached and a neighboring vendor sold us some Walla Walla spring onions. The mushroom vendor had the most gorgeous fresh and local morel mushrooms that we decided to splurge and indulge ourselves in this treat. Here in Washington state, organic pears and apples abound and, as you’ve noticed by now, make a frequent addition to our meals in some form or another. Cut the morel mushrooms in half and lightly dust with a little bit of whole wheat flour [this will create a gravy later on], salt and pepper. Set aside. Remove the turnip greens and wash. Chop the greens and set aside. 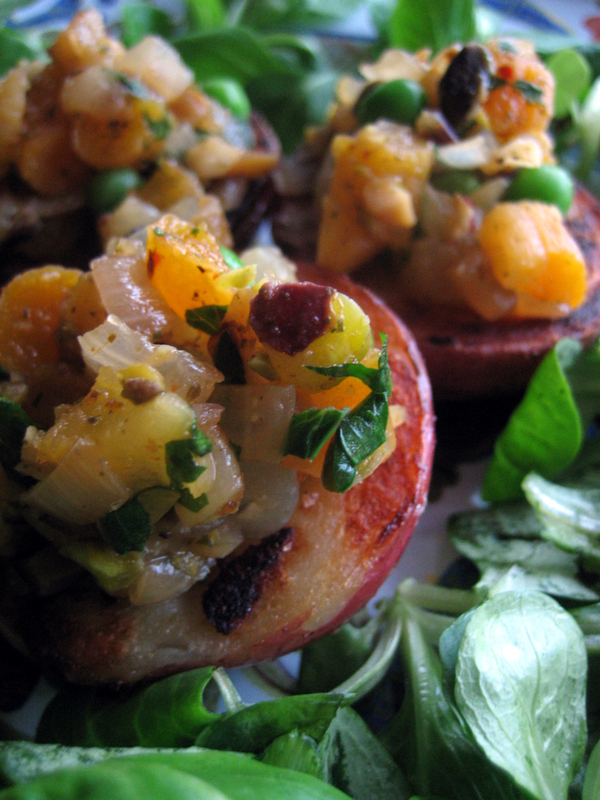 Cut the turnips into quarters and set aside. Add a couple of teaspoons of coconut oil to a hot pan and add the sliced onions. Sauté until the onions are softened. Add the garlic and turnips. Continue to cook over medium heat until the turnips begin to caramelize. Add the pear. 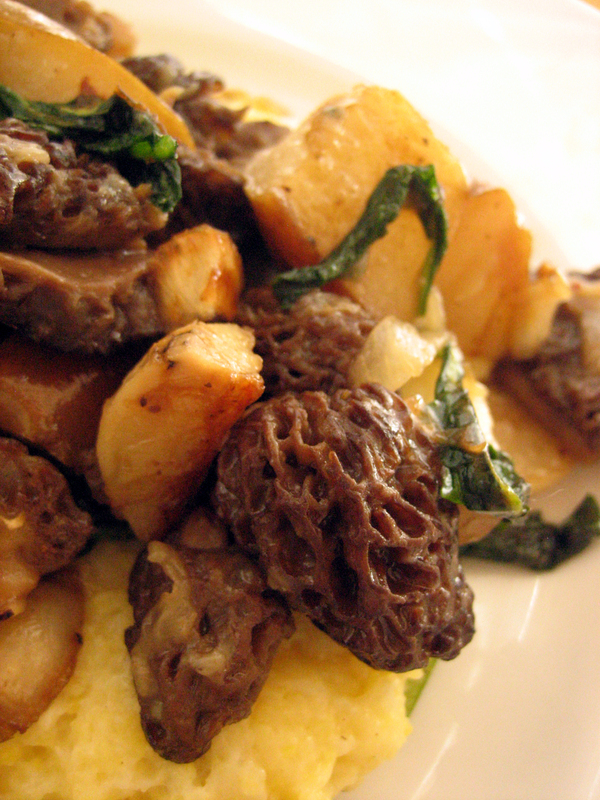 Once the pear has caramelized, add the morels. Mix well and turn often to fully expose the mushrooms to the pan. Once the mushrooms begin to wilt, add the broth and turnip greens and cover. Simmer until the broth has thickened into a gravy. Season with salt and pepper. This was wonderful served over some soft polenta. We went nettle picking recently on a local organic farm and walked through a gorgeous pasture full of blooming dandelions. We gathered up quite a few of the beautiful flowers and decided to work them into a meal. 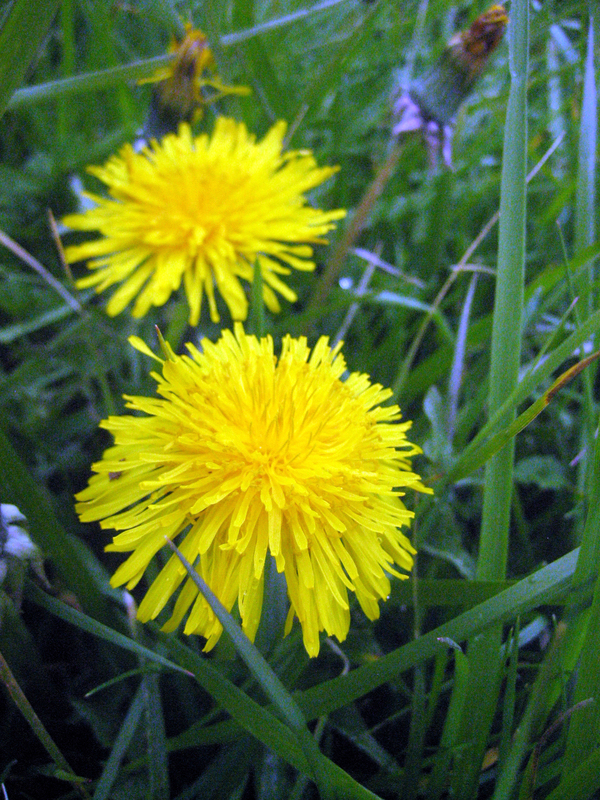 The petals are fairly sweet, while the green of the flower is slightly bitter. I figured integrating them into a salad full of cooked sweet vegetables would be perfect; and it really was. Peel and cut beets into wedges. Place in a pan and cover with broth. Cook over medium heat for 30 minutes or until fork-tender. [Keep an eye on the level of liquid, you may have to replenish.] Remove the beets and transfer into a bowl that can accomodate the entire salad once made. Add the washed and chopped beet greens to the same pan and add more liquid if needed. Cook for about 5 minutes. Drain and add to the bowl with the beet root. Wipe out the pan and add a drizzle of olive oil. Add the thinly sliced fennel bulb and sauté until slightly softened. This should take 5-7 minutes. Add fennel to the salad bowl. Add the dandelion flower tops to the pan and sauté briefly. Add to the salad bowl. Toss the cooked fruit and vegetables and season to taste with sea salt and freshly-cracked black pepper. Either serve warm or at room temperature. 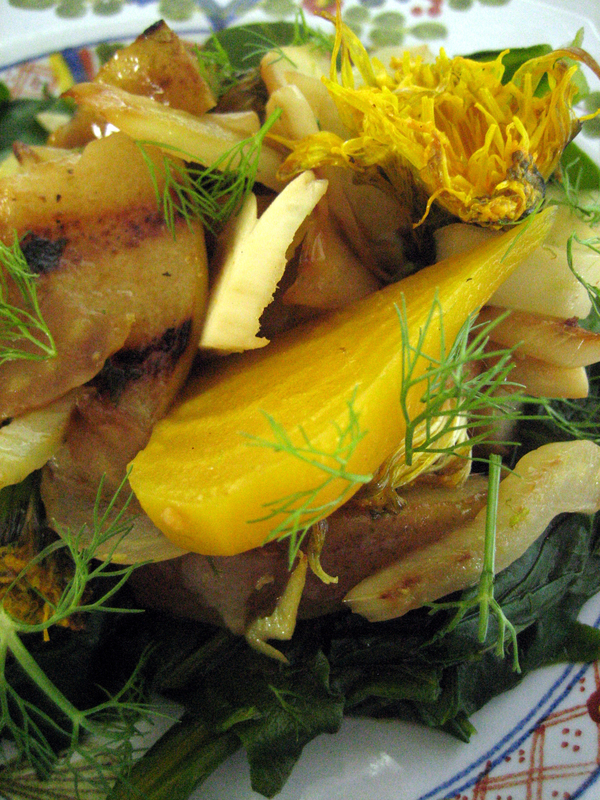 Garnish with fennel fronds. Add cinnamon to the sugar and mix well. Remove 2 T and set aside. Add apple, pear, lemon juice and zest, cinnamon sugar, walnuts, sunflower seeds, raisins, flour and salt to a bowl and mix well. Spread the filling out in a line, length-wise about 3 inches from the bottom edge of the sheet. 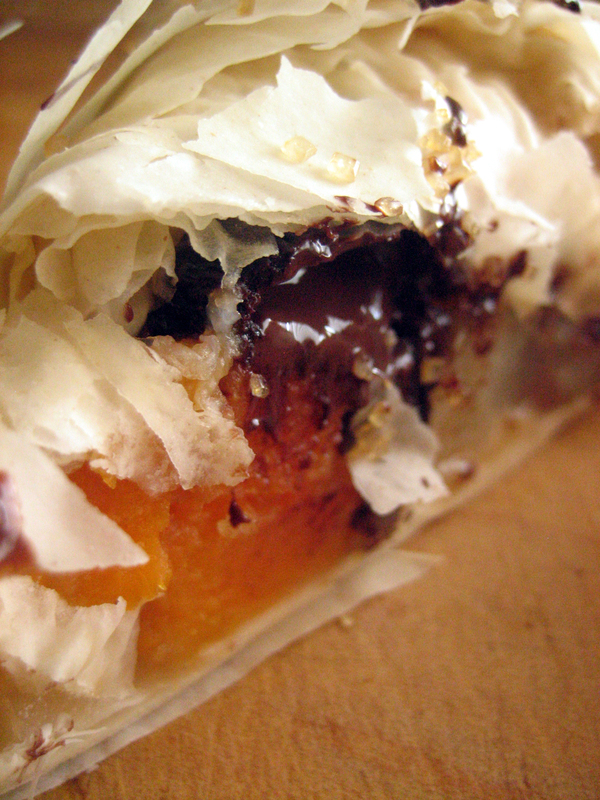 Roll the phyllo over the top of the filling and tuck in the sides as you would while wrapping a present. Continue to roll until all the pastry has been used. Set the strudel seam side down and gently rub the entirety with walnut oil. Dust the remaining cinnamon sugar over the top. Bake for 30 minutes, or until the phyllo is golden brown on the edges.